In a range of sizes to fit almost any size of bed. In range of fillings to suit our UK Manufactured toppers are encased in soft 233TC 100% Cotton to give your bed an extra layer of luxurious comfort. If you can't find your size here please contact us on 01706 220020 or email our friendly sales team with your query. 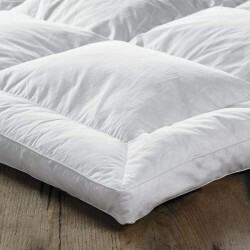 Duck Feather & Down Mattress Topper.In Single, Double, King & Super King sizesSoft..
Feather & Down Combination TopperBase Layer : 5cm layer of 85 / 15 Duck Feather / Down filled lo..
Mattress Topper - Duck Feather & Down Combination TopperIn Single, Double, King & Super King..
Mattress Topper - Hollow FibreIn Single, Double, King & Super King Sizes.7cm deep topper filled .. Metric Single TopperFor 100 x 200cm, 3ft 3" x 6ft 6" BedsCombination topper to fit Metric single bed..
European / Metric Single TopperTopper for 100 x 200cm BedsDown like Hollow Fibre topper. Fille..
Ikea / European Double TopperMattress Topper for 140 x 200cm BedsCombination topper to fit Ikea / Eu..
Ikea / Euro Double TopperMattress Topper for 140 x 200cm BedsDown like Hollow Fibre topper. Fi..
Ikea / European King TopperMattress Topper for 160 x 200cm BedsCombination topper to fit Ikea / Euro..
Ikea / Euro King TopperMattress Topper for 160 x 200cm BedsDown like Hollow Fibre topper. Fill..
Small Super King Topper in 100% DownMattress Topper for 170 x 200cm BedsCombination topper to fit Sm..
Ikea / Euro Super King Mattress TopperMattress Topper for 180 x 200cm BedsDown like Hollow Fibre top..
Ikea / European Super King TopperMattress Topper for 180 x 200cm BedsCombination topper to fit Ikea ..
Long Single Mattress TopperMattress Topper for 90 x 200cm, 3ft x 6ft 6in BedsCombination topper to f..
Long Single TopperMattress Topper for 90 x 200cm, 3ft x 6ft 6in BedsDown like Hollow Fibre topper.&n..